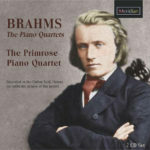 Formed in 2004, the Primrose Piano Quartet has established a reputation for superb performances and award winning recordings. Alongside much loved repertoire of Beethoven, Brahms, Schumann, Schubert, Faure and more, The Primrose have received acclaim for reviving unjustly neglected works by early 20th century British composers such as Dunhill, Quilter, Bax and Frank Bridge. They have commissioned leading composers of our time, including the late Sir Peter Maxwell Davies whose piano quartet was written for them in 2008.